RJ Power Rail recently attended an interactive safety event held by science-based technology company 3M, designed to explore different ways of improving health and safety in the workplace. The event took place on Thursday 5th October at 3M’s UK head office in Bracknell and allowed attendees to engage in a series of informative discussions led by experts from a range of industries. 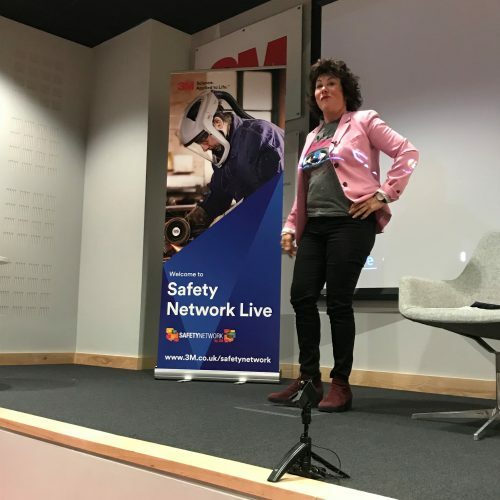 Comedian and mental health campaigner Ruby Wax was the headline act, providing a ‘tour of the mind’, share strategies for maintaining healthy minds in the workplace. Ruby holds a Master’s degree in Mindfulness-based Cognitive Therapy from the University of Oxford and has written several books on the subject. During her appearance she discussed how mental health can be a factor when under stress at work, and how to manage those who could be at greater risk. The event also included a ‘Messages with Impact’ talk from Marcus Webb, Communications Specialist at Body Talk, who showed visitors how to use techniques adopted by screen and script writers to hook their audience. Technical staff from 3M held presentations on the correct use of ear plugs and rescue hoists for people working underground, while the company’s Technical Specialist Jason Morey held an in-depth question and answer session on the causes of Hand-Arm Vibration in the workplace, exploring ways to reduce the risks and effects of this potentially crippling syndrome. The event was concluded by an interactive session from training provider The 2 Macs, who organised a role-playing workplace safety scenario, which focused on how people’s behaviour and some of the day-to-day demands of work can cloud people’s judgement in relation to safety. “Events like this are an excellent way for rail engineering businesses like RJ Power Rail to explore best industry practices. It was also a great opportunity to network with our peers to further develop our safety brand. As a specialist electrical contracting business, we operate in a safety-critical industry where our standards have to be first class, and so it is imperative that we constantly keep up to date with new safety developments. RJ Power Rail was recently accredited to the environmental standard 14001 for its environmental approach and is a Principal Contractor to Network Rail, which reinforces the company’s daily dedication to the most rigorous standards in health, safety, quality and environmental management.